Display the last six photos. This is my current strategy, and has the disadvantages outlined above. Its main advantage is that it is simple, and requires no history. Display a random six photos from the last X photos. This has the advantage that it will keep changing, and will have a much greater chance of displaying all of the recent photos from time to time, especially if X is large. It is also quite simple. But the chaotic nature of randomness puts me off a little — a visitor can't know what to expect. Progressively work through new photos. Each is displayed for a period of time. This spreads the freshness out over a longer period of time, but it is quite complicated. It involves keeping track of all photos posted, and having some algorithm to decide when to move on. Hand-pick favorite photos from each photoset. This has the advantage of displaying a wider variety of photos, of higher quality, but has the disadvantage of not giving them each a chance. It also means I have to write infrastructure to keep track of favorites, or tie into Flickr's favorite mechanism. My redesign is live. I spent quite a bit of time with this design as a showcase of my knowledge of modern web design. The previous design was around 6 years old, so it was well past time for a facelift. Let me know what you think! 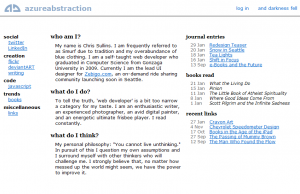 HTML5 — I used header, sectioning elements and an IE8 shim. Typekit — This is for the fancy web fonts. OOCSS grids — This is Nicole Sullivan's CSS framework. 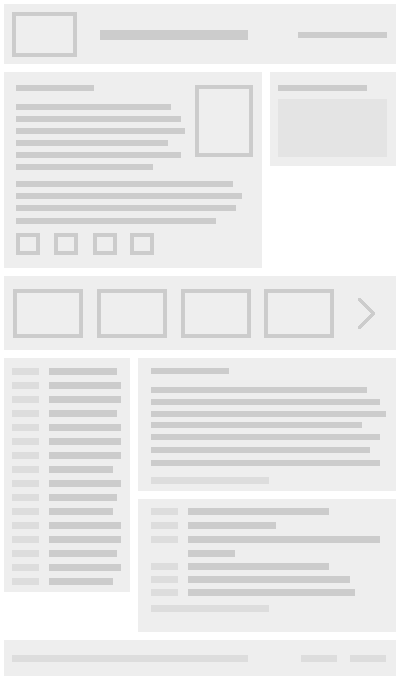 Responsive design — The basic scheme is closely related to the grid system. Advanced CSS — Take a look at the Flickr stream; it was tricky. Interestingly, the old design used an early technique similar to responsive design: the horizontal columns collapsed into one vertical column depending on the page width. This was accomplished using floats, percentage widths and something to cause overflow. The new design goes much farther with responsive design, and applies subtle changes to the layout to fit any size screen. Unfortunately, I was unable to use responsive image techniques for my Flickr stream, due to the complicated css to center the square images. I may revisit that, although the technique is impressive in its own right. 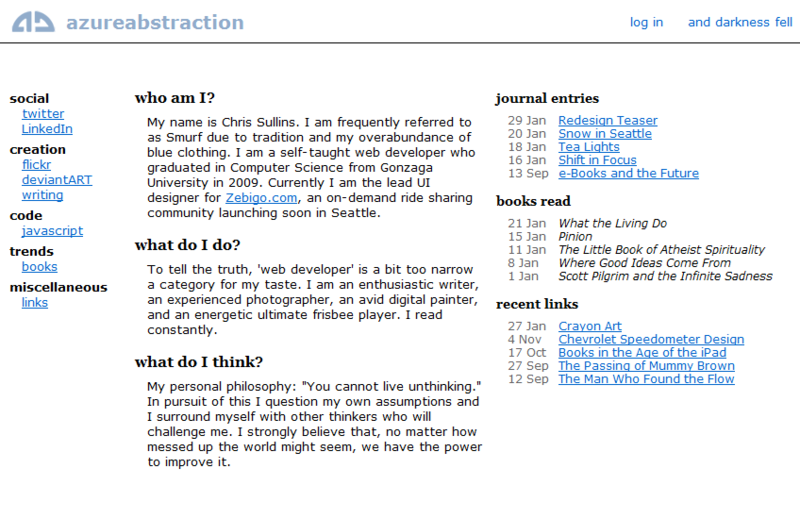 I've been working hard on a redesign of my home page for a couple weeks. I started with a few quick sketches, then created wireframes in Fireworks. I've now built a functional page, which I will push live as soon as I'm done revising the copy and making a few other small refinements. As a teaser, here is the wireframe image. I've been thinking about the focus of this blog for some time now. My website is a combination of personal and professional, but this blog has remained solidly personal. In the past I've put off writing technical articles on here. I wanted to wait until I had some method of segregating the content so that people who didn't want to hear about my personal life wouldn't, and people who didn't want to hear about programming and design would be spared the horror. That's not realistic. So I'm going to try an experiment. I'm going to mix articles about my life with articles about design. Maybe it'll take us somewhere new and exciting.